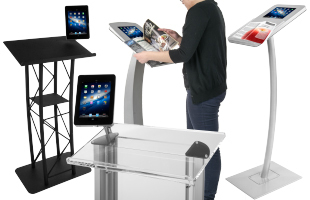 From traditional wooden lecturns to contemporary acrylic podiums, Displays2go has the largest in-stock inventory of speaking stands. Our hardwood furniture is very durable and comes in a variety of different finishes, which is perfect for churches and other ornate settings. 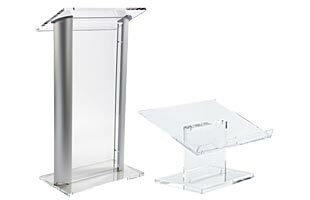 The clear lecturn with acrylic construction is quite popular among modern convention centers and today's universities. The see-through design is very cool and keeps the focus on the speaker rather than the stand itself. 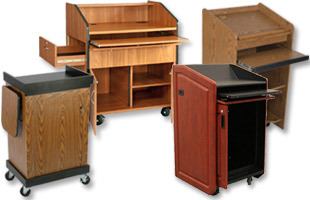 There are all kinds of school lecturns for sale in our online catalog. Be sure to take a look at every option and pick the most practical unit for your application. Many of our podiums are assembled onsite, so we are able to provide faster shipping, despite the large size of these podiums. 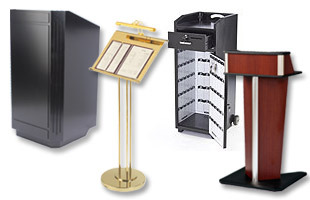 Where are lecturns (sometimes spelled "lecterns") used? The reading stands are ideal for any area where teachers and students gather. What considerations should be made when choosing wood, metal, or acrylic? Customers should examine all the features of these professional lecturns while thinking about their specific applications. 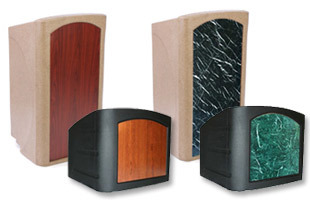 Churches, worship centers, and chapels are some of the most places to see these speaking pedestals. 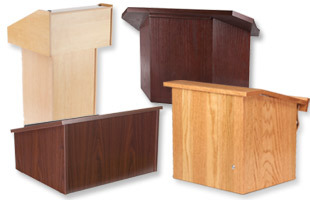 The hardwood pulpits offer that traditional look pastors, preachers, and priests are crazy about. Some models even feature religious crosses on the front panel, which are perfect for churches. 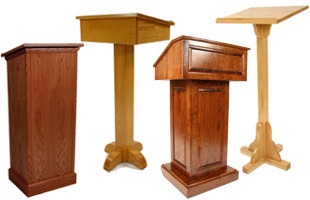 Primary schools, high schools, and universities also use wooden lecture stands due to their durability. 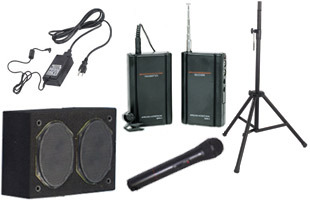 The long-lasting construction is sure to endure lots of years on an auditorium stage or in the front of a classroom. Although the wood designs are great for educational locations, the clear acrylic and modern metal are pefect for more contemporary institutions. 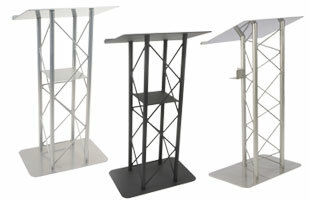 Vocational and technical schools frequently opt for the transparent podiums to show that they are on the cutting edge. Metal units can be purchased in two styles. There are truss assemblies that are durable and feature a modern look as well as acrylic and metal configurations that combine both materials for a new-age appearance. There are even options that can be customized with special graphics. The acrylic models that support customization are ideal for companies, organizations, and non-profits. Optional logo plates make sure your business or organization is remembered! In addition the styles mentioned above, we offer many wood alternatives. 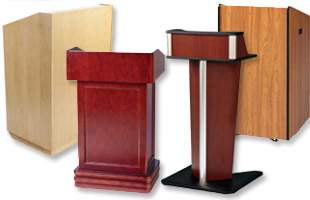 Sometimes hardwood podiums are a little on the heavy side, especially if the user requires more portability. There are laminate, melamine, medium-density fiberboard, and other man-made wood options to choose from. A portion of these models are designed to fold down for easy transport. This way, lecturers and guest speakers are able to travel to and from events with ease. There are also more permanent fixtures, so the teacher or professor does not have to lug around the furniture. Instead, it is ready upon arrival. Either style is perfect for hard use due to the exceptional durable construction. Choose a man-made wood option to save a little money without sacrificing the upscale look and finish. 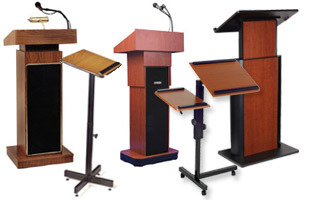 These economy pulpits and podiums are excellent solutions for all kinds of lecturing applications. 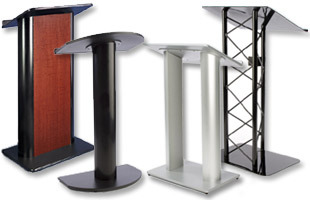 Although most of the podiums are engineered with stationary or fixed designs, there are some that offer adjustability. 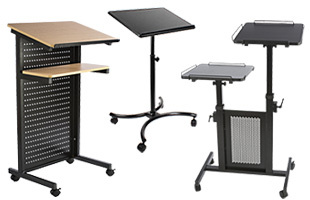 There are not only height adjustable configurations (in both pneumatic and manual designs), but also there are stands that allow the reading surface to tilt. The top of the pulpit can actually be angled or set flat to accommodate different needs. 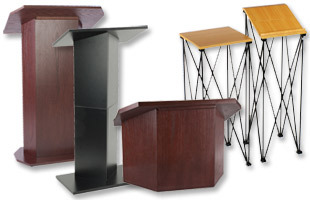 The versatile design makes these speaking stands some of the most unique. Simple adjustability gives the podium a completely different look, which makes it special when compared to many traditional systems. 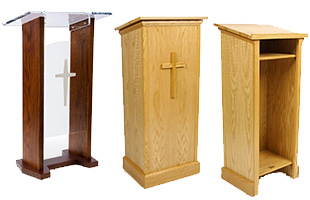 There are also extra-wide pulpit-style configurations that are great for large stages and alters.